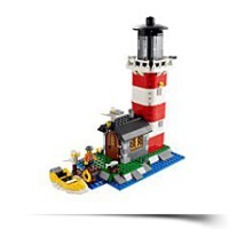 Keep the harbor secure with the 3-in-1 lighthouse! Once the ships are safe, rebuild into a boathouse to dock your motorboat or change into a seafood restaurant with a light-up oven to offer the sailors a warm meal. Everything you demand for a protected ocean cove is right here! Use the binoculars as you peer out in the lighthouse for incoming ships! Open the back of the lighthouse to access the stove and ladder. Press the roof to activate the LEGO light brick and turn the handle to rotate the mirror to warn ships lost in the fog! 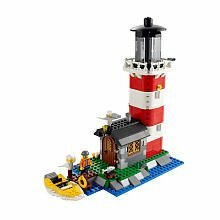 This 3-in-1 lighthouse rebuilds into a sturdy boathouse with a warning light and a cozy seafood restaurant!